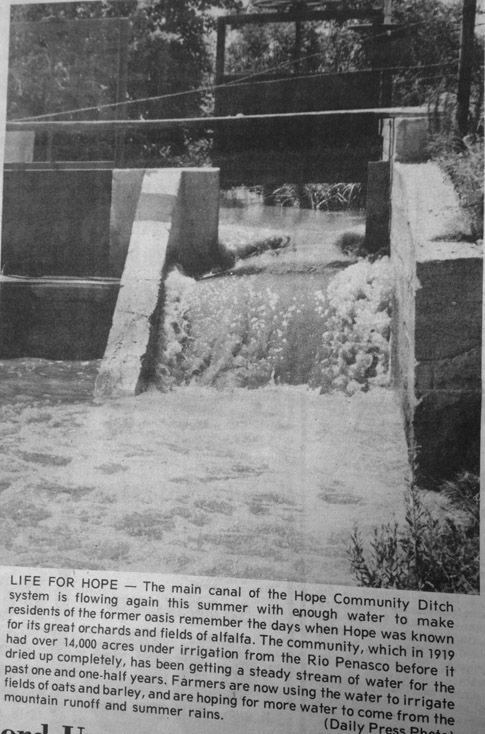 Looking back 40, 30 and 20 years ago, the following are excerpts from the Artesia Daily Press from June 12-18. Mike Heathington, ace hurler for the 1976 state champion Artesia Bulldogs, combined a super effort from the mound with a two-run triple in Friday’s opening game of the North-South All-Star baseball series to give the South a 5-3 victory. The series was to conclude Saturday with a double header in Las Cruces. J.B. (Jack) Vermillion, apprentice pipe fitter at Navajo Refining Company, was presented a watch for 30 years of service at the Artesia refinery. Vermillion was employed by Continental Oil Company on June 10, 1946. He continued employment when Navajo Refining Company purchased the refinery in 1969. A new face was added to the deer pen at Roberts Park Monday afternoon. A newborn fawn made its debut Tuesday at about 1 p.m. with wide eyes and wobbly legs. As reported in the Pinon News: Mr. and Mrs. Oliver Rhuebush were to go to Silver City, Saturday to take a large picture, Mrs. Rhuebush had painted for the baptistery in a church there. The Rhuebushes live at the Camp of the Tall Pines north of Weed. He works there as custodian. Several score people were picking through what remained of the Lake McMillan fish supply Friday afternoon, shortly after the dam was opened wide to completely drain the reservoir. Fishermen surveyed the thousands of fish stranded in shallow pools of water below the spillway. The state game department declared the lake an emergency area Friday and issued authority for persons to take fish by spears, bow and arrow, seines under 30 feet in width, or by conventional methods. Thousands of fish, stranded by receding waters, had already died late Friday as a result of the drainage. Opal Lee and Lorraine Miller, members of the Yucca CowBelles, presented Good Samaritan Center administrator Judy Milner with a gift of beef in honor of Father’s Day. The yearly gift is part of the group’s ongoing campaign for beef promotion. The American National CowBelles first began promoting beef for Father’s Day in 1953. As reported in the Pinon News: It has been reported here some of the ranches in the north end of the Guadalupe Mountains have been sold and among them was the Panama Ranch. Also, it was reported the Watts Ranch near Dunken was sold to the same company. Mr. and Mrs. Colin Hobbs from the Panama Ranch were in Pinon Tuesday of last week. Mrs. Hunter Smith took Hunter’s mother, Mrs. Ethel Smith, to Roswell Sunday morning to spend a week with Mrs. Daisy Cartright. Former Artesia High School baseball player Antony Hall is among the top prep baseballers in the state who will square off in a three-game North-South series beginning Friday in Las Cruces. Stallone’s “Cobra” and Schwarzenegger’s “Raw Deal” were the featured films at the Cinema Twin. All-season motor oil was 79 cents per quart at Car Quest. Youngsters in the Artesia Public Library’s Summer Reading Program got some hands-on experience this past week when members of the Stitch ‘N’ Stock 4-H Club brought their animals out for young readers to pet. Angela Usherwood, daughter of Steve and Karen Usherwood of Artesia, was selected New Mexico High School Rodeo Queen earlier this month in Carlsbad. The senior at Artesia High School is a member of choir, New Horizons, the AHS Rodeo Club and FFA. In her spare time, she enjoys water skiing, singing, and running horses. Employees of Norwest Bank recently painted an Artesia home as part of a project in cooperation with Artesia Clean & Beautiful. The house was one of two that Norwest employees plan to paint as a community service.